The Russian research vessel Akademik Fyodorov arrived at its St.Petersburg port this past May with samples from 14-million year old subglacial waters of Lake Vostok in Antarctica, Earth's analog for what we might encounter on future probes of the 64-mile deep oceans of of Saturn's moon, Europa. The ice cores and possible microbial artifacts were delivered to the Arctic and Antarctic Research Institute laboratory for thorough study. This week the preliminary results of the upper layer of the ancient lake are in: the first analysis of the ice that froze onto the drillbit used in last February’s landmark drilling shows no native microbes came up with the lake water, according to Sergey Bulat of Petersburg Nuclear Physics Institute (Russia) and Nature blog. This uppermost zone of Lake Vostok appears to be “lifeless” so far, says Bulat, but that doesn’t mean the rest of it is according to what he calls his team’s “very preliminary results” on Tuesday, at the 12th European Workshop on Astrobiology (ENEA 2012), in Stockholm, Sweden, at the AlbaNova University Center. Bulat and his colleagues counted the microbes present in the ice sample and checked their genetic makeup to figure out the phylotypes. They counted fewer than 10 microbes/ml — about the same magnitude they would expect to find in the background in their clean room. And three of the four phylotypes they identified matched contaminants from the drilling oil, with the fourth unknown but also most likely from the lubricant. A team of Russian scientists was the first to pierce the ice shield to the surface of Lake Vostok early in February of 2012. Lake Vostok is approximately 250 kilometers long and up to 50 kilometers wide (around the size of Lake Ontario in North America), and is up to 800 meters deep. It is isolated from all the other 145 or so subglacial lakes in Antarctica. The lake has been sealed off by the ice sheet for the past 14 million years. The Russian scientists drilled down to the oxygen-rich lake at the rate of four meters a day, which is buried beneath a sheet of ice almost four kilometers thick, and extracted water samples for analysis. If extreme life is found in the lake, this would have implications for the possibilities of life on Jupiter’s moon Europa or Saturn’s satellite Enceladus, both of which host a similar environment. 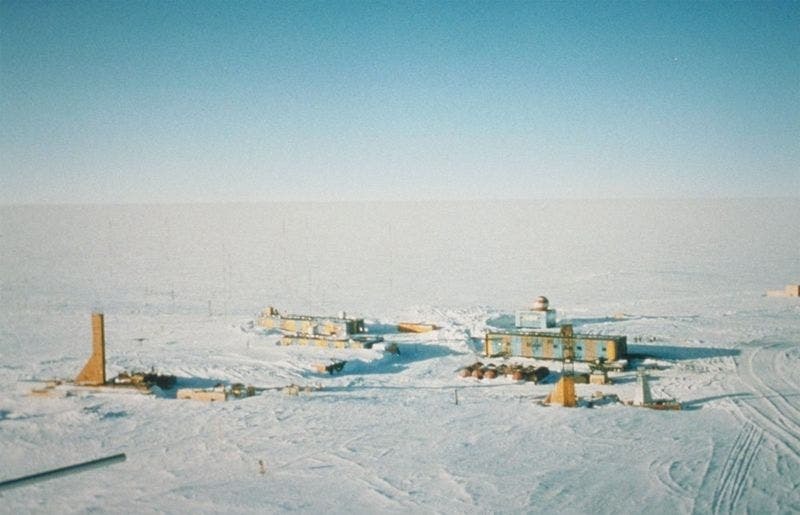 Earlier plans to drill into the lake were squashed by the Antarctic Treaty Secretariat (ATS) because of concerns the lake might become contaminated. A team of astrobiologists from NASA concluded in 2003 that such an exploration could be dangerous and lead to contamination because the high oxygen and nitrogen content of the lake would cause the water to “fizz up” like a shaken soda can. 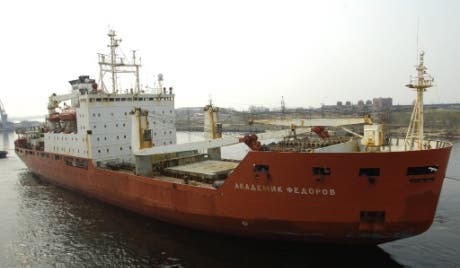 But the ATS approved the environmental evaluation for the new attempt by scientists from the Arctic and Antarctic Research Institute (AARI) in St. Petersburg. Lake Vostok is supersaturated with oxygen, with levels estimated to be around 50 times greater than an average freshwater lake. Researchers hoped to find live organisms in the lake, particularly in the mineralized water near the bottom. If life does exist there, the organisms would be “extremophiles,” with many adaptations to allow them to survive. "Lake Vostok is an international treasure. We have to convince not just the scientific community but the entire world that we can do this without contaminating the lake," said Karl Erb, director of the NSF Office of Polar Programs. At the very edge of the Antarctic ice horizon is a scattering of snow-drifted buildings and radio towers known as Vostok Station–a Russian scientific outpost on the ice above ancient Lake Vostok that researchers have manned almost continuously for 40 years. Because of the long isolation, it's believed that Lake Vostok could contain new lifeforms, and unique geochemical processes. The overlying ice provides a continuous paleo-climatic record of 400,000 years, although the lake water itself may have been isolated for as long as 15 million years. Russian researchers have thawed ice estimated to be perhaps a million years old or more from above the ancient lake that lies hidden more than two miles beneath the frozen surface of Antarctica. Scientists used genomic techniques to determine how tiny, living "time capsules" survived the ages in total darkness, in freezing cold, and without food and energy from the sun. A major issue is the reality that it is impossible to penetrate an isolated ecosystem without contaminating it. The "Catch 22" inherent in exploring Lake Vostok is that the very thing that make it potentially unique: because of its millennia of isolation from the rest of the world, it cannot be explored without introduction of microbes from the outer world. Over the years, the Russian scientists here have endured temperatures colder than parts of Mars, dwindling support and reflexive skepticism about the quality of their research from colleagues in Europe and the United States. Recent financial cutbacks in the Russian Antarctic Program meant that Vostok can be resupplied just once a year. Fuel and food are hauled overland by tractors about 900 miles from the coast. Mechanical breakdowns sometimes prevented the overland tractor trains from reaching Vostok. It was Russian scientists at Vostok Station who discovered the lake and who first realized its unique potential. Now they hope that the international effort to explore the life in the lake might benefit their own faltering research program. In the most ambitious drilling program ever undertaken on the southernmost continent, the Russian scientists produced the world's deepest ice core, containing an irreplaceable chemical record of more than 400,000 years of Earth's changing climate and atmosphere. They did not learn of the lake's existence or appreciate its importance until the project neared completion. In our era of rapid climate change, it's important to realize that over 6 million cubic miles, about 70% of the planet's fresh water is locked in Antarctica's ice, about 90% of which is locked up in the apparently stable East Antarctic ice sheet, set on the rocky continental surface and partly hemmed in by mountains. 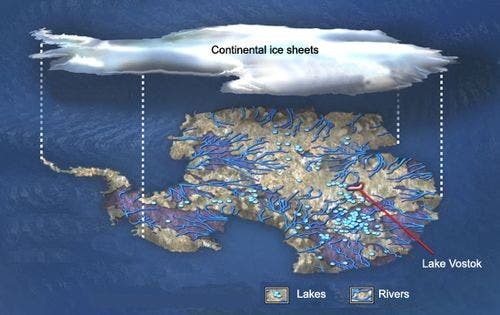 Scattered in pockets between miles of ice and the rock foundation , are at least 145 lakes of unknown origin, connected by streams in an entire unseen hydrologic plumbing network, a system researchers believe that may affect the stability of the ice sheets. No other natural lake environment on Earth has this much oxygen as Lake Vostok -an oligotrophic extreme environment, one that is supersaturated with oxygen, with oxygen levels 50 times higher than those typically found in ordinary freshwater lakes. The sheer weight of the continental icecap sitting on top of Lake Vostok is believed to contribute to the high oxygen concentration. Microbial organisms in Lake Vostok must be capable of overcoming very high oxygen stress, and may have had to evolve special adaptations, such as high concentrations of protective enzymes, in order to survive. The discovery of interconnected lakes beneath kilometers of ice in Antarctica could be one of the most important scientific finds in recent years, but proper procedures need to be established before investigation begins, says Mahlon "Chuck" Kennicutt II, professor of oceanography at Texas A&M University and a leader in the research efforts. The National Science Foundation and 11 countries involved in the research and exploration are seeking agreement on how best to study these unique environments, which include at least 145 lakes under Antarctica's massive ice sheets. "This has the potential to be one of the most important scientific discoveries in years, since sub-ice water appears to be an important player in many different processes fundamental to Antarctica and our planet," Kennicutt said. "We believe that these lakes are part of an interconnected system that spans the entire Antarctic continent," he added. "These bodies of water are several miles beneath the ice sheet which took millions of years to form, meaning these lakes have been undisturbed and disconnected from our atmosphere for hundreds of thousands of years. It is highly likely that unique microbial communities that we never knew existed are lake residents." Lake Vostok an excellent Earth-bound staging-experiement for Europa, a moon of Jupiter believed to have ice-crusted oceans. Scientists believe Europa's ocean, which is warmed by gravitational forces, could be one of the best places in the Solar System to look for life.